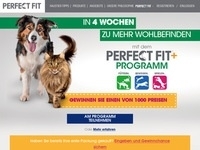 Perfect Fit helps cat and dog preserve their youthful spirit with a holistic approach to pet health that combines advanced nutrition, exercise and mental stimulation. Lead is considered fulfilled when the user has clicked the confirmation email. No intensified traffic, no cashback.